As far as speed and thrash metal goes, this gig was set to be one of the best in Glasgow this year. 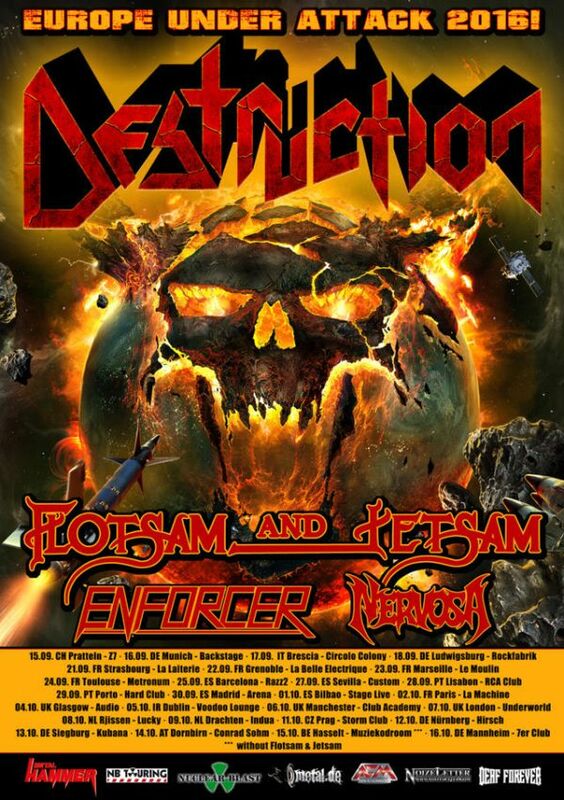 The opening band was Brazilian thrashers Nervosa, however I unfortunately missed their performance due to my interview with Destruction’s Schmier starting late and running over time. I definitely hope to see and review Nervosa in the future! I walked into Audio part-way through Enforcer (7)’s set and to say the gig was sold out was an understatement. The room was packed like a tin of sardines, and there was an intense heat radiating throughout the space with sweat dripping down the walls. The crowd at first seemed to have a rather lukewarm reaction to the Swedish speedsters with a few raised fists sticking out amongst a sea of politely nodding heads. After a few of Enforcer’s energetic anthems from throughout their career such as “From Beyond”, “Live for the Night”, “Take Me Out of This Nightmare” and “Midnight Vice”, the audience warmed up. More heads were banging, more horns were raised and more voices were shouting. Enforcer certainly made a great start to the show in my opinion with their brand of high speed, melodic and catchy metal, and left a feeling of great anticipation for the rest of the show. Next up was legendary melodic thrashers Flotsam and Jetsam (7). The band showcased a lot of more modern material from their latest self-titled effort with a handful of classic hits peppered throughout the set. The crowd reaction to the newer songs was rather tepid in comparison to the old-skool numbers however there were plenty of singalongs and banging heads throughout the set. Though enjoyable, the classic songs (including “Hammerhead”, “Desecrator” and “No Place for Disgrace”) seemed to played at a slightly slower tempo than usual which somewhat took some of the energy of the show away in my opinion. However, there was still a mosh pit for every song, and good times to be had to Flotsam and Jetsam’s old-skool sound. The band’s performance was rather tame in comparison to the last time they performed in Glasgow however Flotsam and Jetsam still put on a good show. Headlining the night was much anticipated Teutonic thrash terrors Destruction (8). These guys always know how to put on a great show with their high energy thrash anthems. The set was a good mix of classic Destruction and newer material with a couple of highlights from their latest album Under Attack. Audio was sweltering with the heat of the sold out gig and the sweat was dripping as hair was flailing throughout the show. There was chanting and moshing and raised fists aplenty to Destruction hits like “Curse the Gods”, “Mad Butcher”, “Nailed to the Cross”, “Under Attack” and more. The performance was tight, heavy and energetic, and frontman Schmier expertly engaged with the crowd.